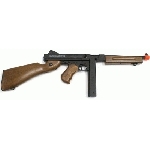 Chicago typewriter, Tommy gun, or its real name; the Thompson Submachine Gun was the gun of the prohibition in America, and was used widely for law enforcement during that time. It gained support from both civilians and the military, due to its unmatched compactness and rapid automatic fire, capable of releasing over 900 rounds per minute; 15 per second. The gun was the brainchild of World War 1 general John T. Thompson, who after experiencing trench warfare, set out to design a one man hand held machine gun. It first came into production in 1921, and was originally just sold to civilians, and had critical success, but low sales due to the high price. Sales really took off when several post offices bought arsenals of the Tommy Guns, after a series of mail thefts. This was closely followed by sales to international armies, and the gun even made its way into Irish War of Independence and US Civil War. Weighing in at 10.6lb and just 32 inches long, the Thompson M1A1 is an improved variation of the original gun, and was adopted as the standard submachine gun of the US army. The reason for this decision was not in the size, weight or even in the performance of the gun, but in the way it was produced. Some minor adjustments meant that the M1A1 could be produced in half the time of the original model, and brought the cost down from $209 in 1939 to just $45 in 1944. As a result, the Thompson M1A1 became the main gun of the US army during World War 2, but were used very little after this. They were brought back into public view by the 1998 film 'Saving Private Ryan', which features the gun heavily. Shortly after this film was released, Tokyo Marui, the world renowned airsoft manufacturers, announced that they were going to produce an airsoft replica Thompson M1A1. Shortly after, the gun was released, and proved incredibly popular with both serious airsoft players and collectors alike. The gun is made from metal, except for the imitation wood barrel and stock, which requires a magnifying glass to see that it's plastic. If that's still not good enough for you, then it can be replaced for real wood with relative ease. It's also very similar to the real thing. Fully laden with BBs, battery and the like, the weight of the Tokyo Marui version is just a couple of pounds short of perfect, making the gun feel strong a purposeful. It does however mean that this probably isn't what you want out with you on a daylong pursuit! This gun sums up what all airsoft players want; a well performing AEG, that looks the part and operates well.